I don’t often do beauty posts, only when something comes up that I really believe in. I’m definitely no beauty expert, but I am certainly more interested in beauty products as I get older. I’m also privy to a lot of products: beauty sales at Red, product launches etc. So I thought I’d share a few pictures of what’s actually on my dressing table, and what makes the grade. I rarely paint my fingernails, but I do like to keep them in good condition – this horse fertiliser keeps them nice and strong and when I do, they’re usually blue. I love Mavala ‘Cobalt Blue’ but Cheeky also do fab colours – I get lots of compliments on this colour. 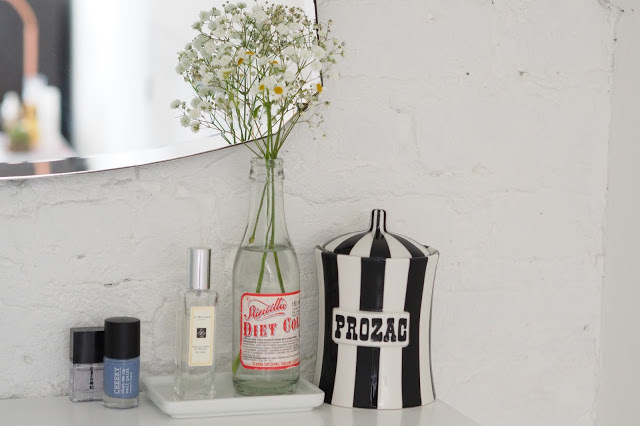 The ‘Prozac’ cannister is one of my favourite brands, Jonathan Adler – my sister bought it for me from New York (it’s much cheaper over there, and the store on Greene Street Soho is so much fun). It’s a far more interesting place for my cotton wool buds! 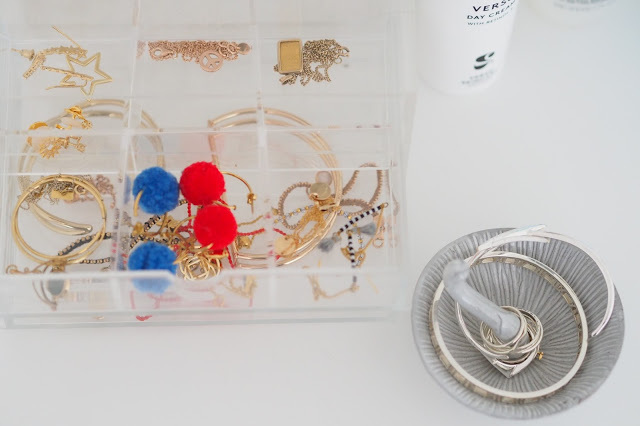 I love trays to separate items – Muji has great china ones, as does H&M. I keep my perfume on mine, ‘English Pear and Freesia’ by Jo Malone was my wedding fragrance and it’s divine – I can never afford the full size bottle, so it’s always these handy smaller sizes I use (better for travel, anyway). This is where it gets sad, as this verso cream was a gift (I would never spend this much on moisturiser) but it is so amazing that I don’t want it to run out! I love the packaging, the thickness of the cream – it’s dreamy. This Darphin micellar water is also my first choice of toner – it’s not cheap, and when I’m feeling a bit ore frugal, the Liz Earle one is also good for £10 cheaper. The Darphin is also gentle enough to remove most eye make-up. I do, however, usually like to use a separate eye make-up remover – and this Nivea one for £3 does the trick. You are probably aware by now that I swear by Muji storage. 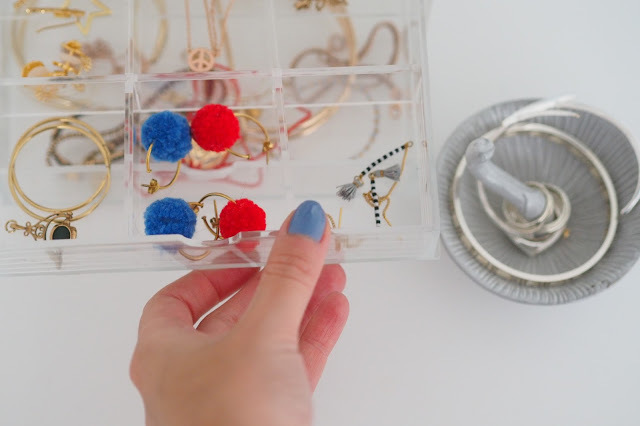 These acrylic drawers separate all my favourite jewellery and stop all my fine chains from getting tangled. Anthropologie and H&M also do lovely ring stands (I love my quirky mushroom one from Anthropologie, pictured). Wearing nail polish in ‘Babe Watch’, £7, Cheeky. Nail horse fertiliser: £17, Butter London. Nail polish in ‘Babe Watch’, £7, Cheeky. ‘On The Hoof’ foot balm, £19, Cowshed. 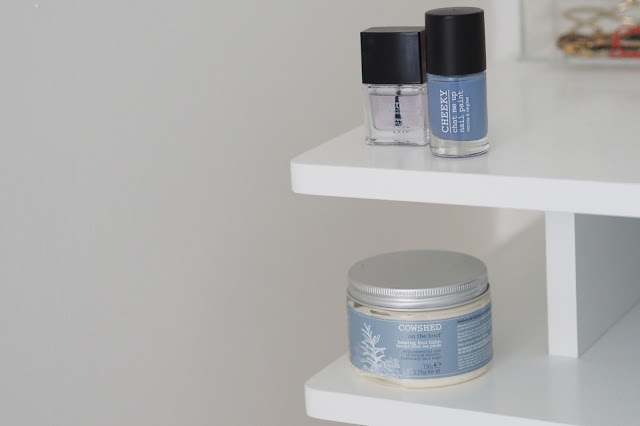 I love a bit of ‘me’ time, and keeping my feet soft with this cowshed balm is my idea of heaven. I also love anything by Margaret Dabbs – her foot oil, in particular, is divine. 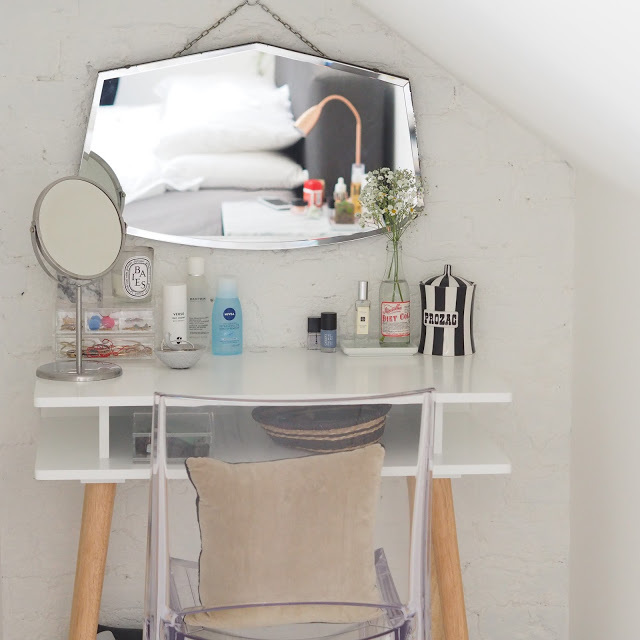 We ended up buying a desk instead of a dressing table for this room, as the space was so narrow, nothing else would fit. It has served us so well and at a good price we ended up buying the grey version for a second desk in our spare room. Stay Matte powder, £22, Clinique – this helps tame the shine. Eye Basics, £21, Laura Mercier – I’ve sung the praises of this so many times – helps eye make-up’s durability and eyeliner no longer runs down my face! 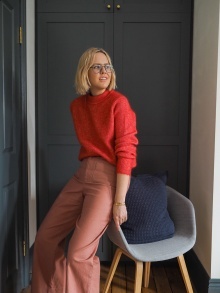 Corrector in ‘Extra Light Bisque’, £19, Bobbi Brown – I now wear this religiously underneath my concealer, and have had a few compliments. Magic eyebrow concealer, £10, Lord & Berry – this pencil is great as it is not just one colour and blends really well. Express day tan for face, £22, James Read – the only fake tan that hasn’t given me spots. Cream blush, £27, Chanel – I prefer cream blush to poder for a more ‘glowy’ look. Camera Ready BB Water, £29, Smashbox – this has revolutionised my make-up regime. Stays on like foundation but feels very sheer, almost like nothing. Liquid eyeliner, £15, Eyeko – my everyday liner. So easy to apply. ‘They’re Real’ mascara, £19.50, Benefit – I’d heard good things about this mascara, and it lives up to my expectations. Illuminating balm, £42, Bobbi Brown – I’ve just started using this under my makeup for a dewy glow. Please can you tell me where your mirror is from? I love it! Also top tip for minimising spots – savlon! It has changed my skin when nothing else worked (tried dermalogica, clarins, clinique, microdermabrasion, IPL treatment and others). My skin is much clearer now because of the savlon! The mirror is from eBay, my sister got it for me, as she's so good at picking vintage finds! And good tip re spots! 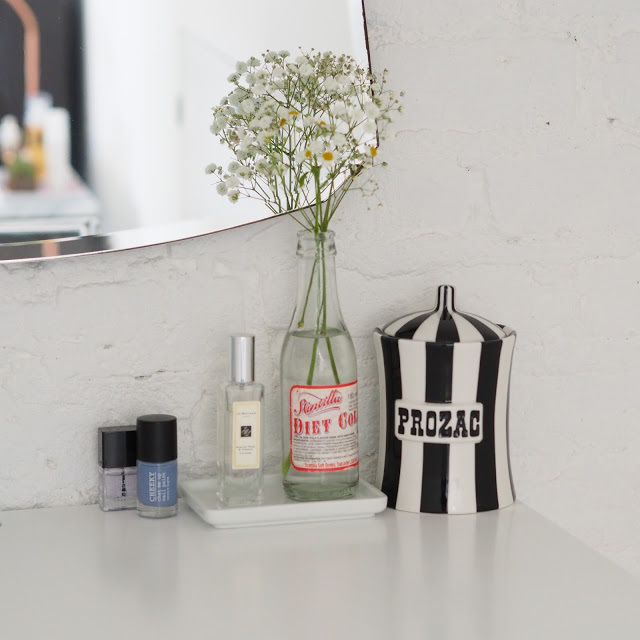 I love your dressing table! 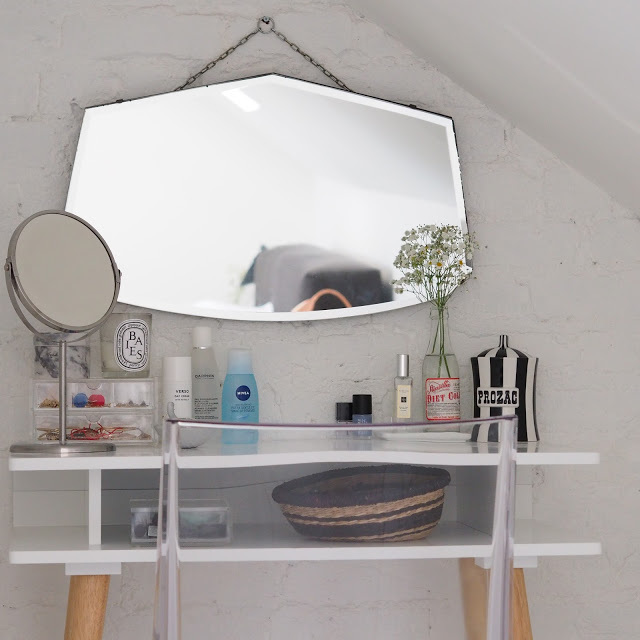 I just realised the other day I don't have a dressing table as we don't have much furniture in our bedroom, and I have such fond memories of watching my Mum get ready at hers it has made me want to get one! 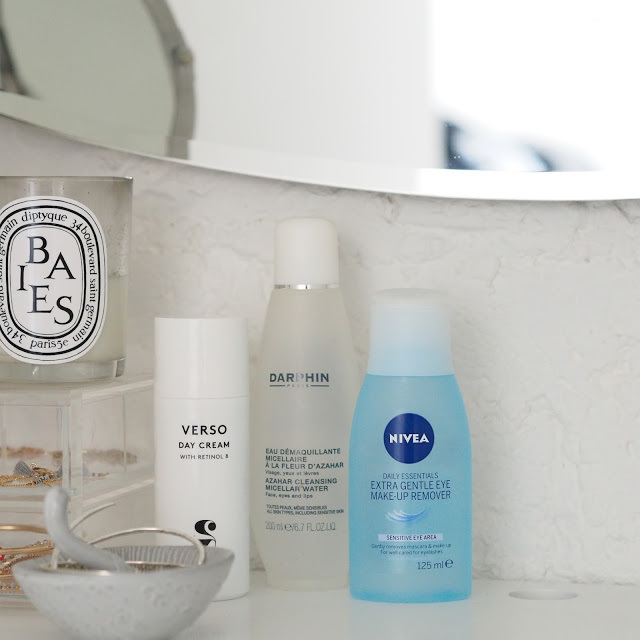 Your mirror is lovely and I love the Muji storage. I need to investigate the nail horse fertiliser, my nails are never very strong. 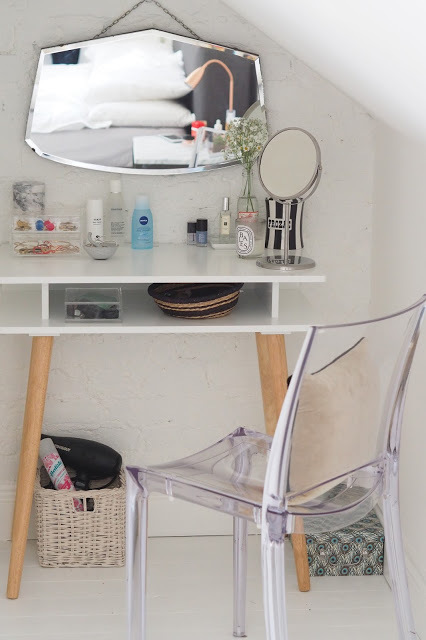 I have been doing my make-up sitting on the floor for about 6 years….and when this space was almost redundant in our loft (due to health and safety we couldn't out the stairs here – v weird! ), my husband let me have it! Makes such a difference getting ready! I love your dressing table, could you tell me where the chair and mirror are from? Thanks, also I would need a light on the table, is there anything that you think would go? Great setup, I like that keep to just items you love plus that clear chair is to die for! If only i can organize my beauty products like these, I somehow scatter everything all the time including a bunch of products i don't even use. Your mirror is cute. 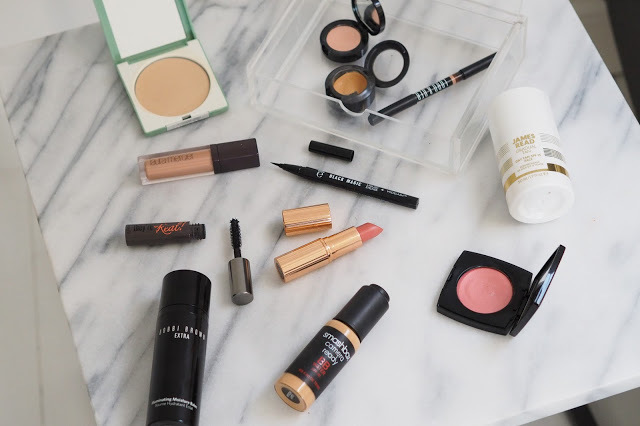 I go through my 'spare' box of make-up regularly – a bit Marie Kondo and really throw out what I don't use/need/will never get round to using. My make-up lasts so long it seems silly having spares around….